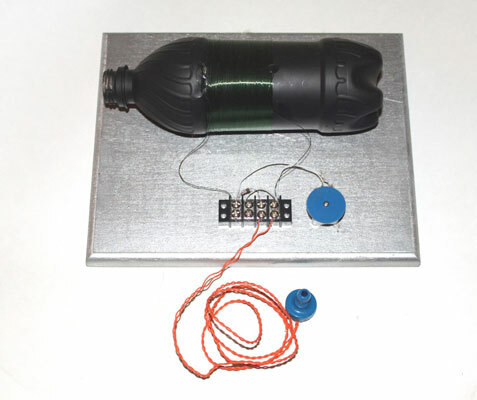 A basic crystal radio receiver circuit consists of just a few basic electronic components: an antenna and a ground connection, a coil, a variable capacitor, a diode, and an earphone. The antenna, of course, captures the radio waves travelling through the air and converts them into alternating current. In order for current to flow, a complete circuit is required. 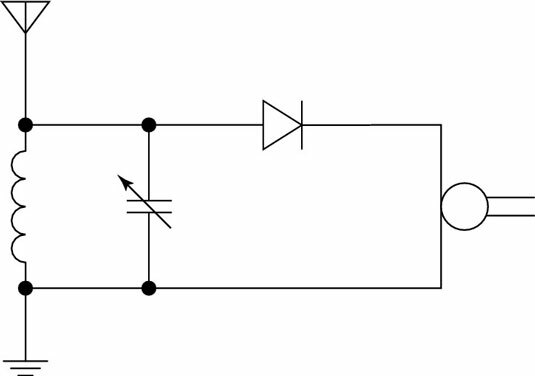 The ground connection is what completes the circuit, allowing current to flow. The combination of the coil and the capacitor form the tuning circuit. The inductance of the coil combines with the capacitance of the variable capacitor to create a circuit that resonates at a particular frequency, allowing that frequency to pass but blocking other frequencies. In a basic crystal radio, the tuning circuit isn’t very precise. As a result, you’ll probably hear several stations at once. However, it is possible to build more sensitive tuning circuits that can hone in on individual stations. The diode forms the detector part of the circuit. It simply converts the alternating current signal that comes from the antenna and tuning circuit to direct current. This direct current is extremely small, but it is enough to drive a sensitive piezoelectric earphone, which converts the current to sound. So that, in a nutshell, is how a crystal radio works.